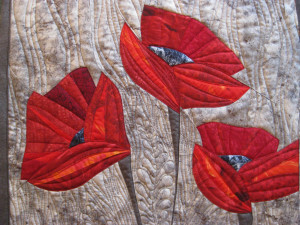 The quilt stitching I’m discussing today is for a unique art quilt with three red poppies on a dynamic but neutral background. 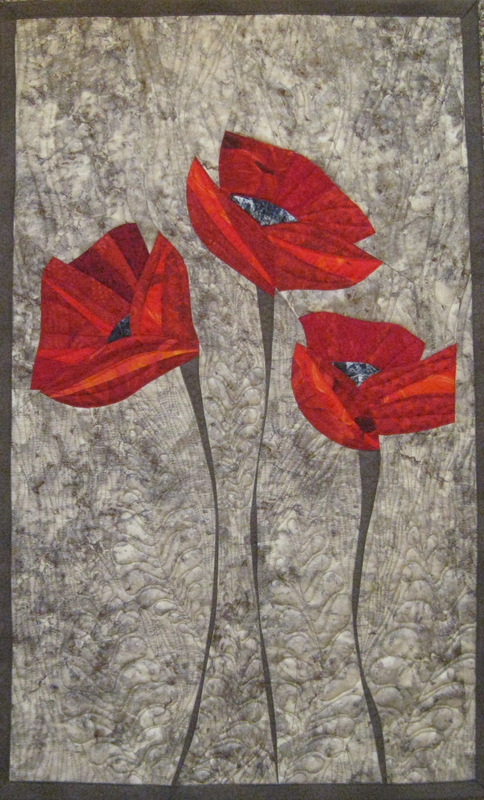 As with all my quilts, this one is pieced so the background is in many different pieces as it is added around the poppy pieces. The background fabric is absolutely part of the artist quality of this quilt with its different tones, textures, and variety of neutral colors. I didn’t want to lose the impact of the background so I needed to quilt it in such a way as to enhance it without masking it. I used a barely visible thread, one of the medium colors in the fabric. You can see in the detail pictures how I quilted leaf-like designs by the stems and then filled in with minimally curved (but not straight!) layered design stitching, almost like a tree bark design. On the quilt this tree bark design filled in the lower two thirds of the quilt in a subtle way but also added texture. The less dense and more flowing curved quilting above the flowers creates a more opening message about the poppies, whereas the more dense stitching below feels closer to the earth. 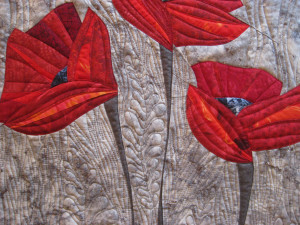 The flowers themselves I quilted with minimally curved lines which separate them from the rest of the quilt background. I wanted to try different colors in the background in this quilt, something not green and blue, something which would make the red flowers pop out yet still feel some softness in the design. And I wanted the variability of the mottled look of the background fabric to contrast with the stark reds of the poppies. I’m happy with the overall effect of the finished quilt.